Allen Wilson first graced the walls of the MasterLube Alumni Wall back in 2013. But since then, he has returned to a career he has always loved. “I work with toys!! Snowmobiles, atvs, etc,” explains Allen, who now works for Elevated PowerSports. 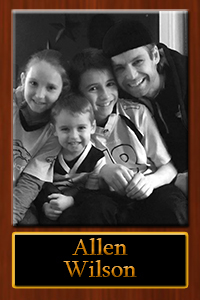 Before working as the assistant manager of the Heights Four Seasons MasterLube, Allen worked for Hi Mountain Recreation and he is very excited to be back working in the field he loves. “It was fun times,” he said of his time with MasterLube, adding that he made lots of new friends and built good relationships with his customers. Building good relationships with his customers still remains Allen’s favorite part of his work. When he isn’t working on his customer’s toys, he enjoys his own adventures – flying remote control planes and helicopters and playing basketball. And he loves to spend time with his family watching the Broncos!